Lutece Langue French school in Paris was founded in 1997 by Eriko Pagnon, who is a native of Japan, passionate about language learning. Together with a carefully selected team of native French educators, she set about creating an ideal environment for students using a dynamic and personalized immersion method of teaching French. Today, more than 20 years later, Lutece Langue has a highly regarded reputation for language learning and student care. When Eriko moved to Paris in 1996 with her French husband she barely spoke French. However, she had already a dream that she wanted to realize – to create an ideal French language school for “students” in Paris! With her rich experiences as a “student” in language learning, she had a clear idea of an ideal language school that she herself would be happy to attend. 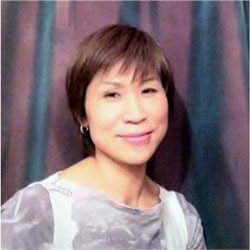 Eriko has studied languages in public and private institutions in Japan, England, the United States, Canada, and France. Naturally, she knows language learning is rewarding and gives a great pleasure. But, she also understands it can be difficult, frustrating, and disappointing at times. During her time as a student, she was able to assess various teaching methods. This led her to identify many of the problems and weaknesses within the system. She discovered that many language schools have too many students with class sizes that are too large. This means the schools are unable to provide personalized attention and the teachers are also unable to address the needs of the individual students. At LUTECE LANGUE, classes are limited to 2-7 students to maintain our high standards of quality and service. Keeping classes small is crucial to ensure students to have the teacher’s attention they need during their course. Learning French is an investment of time and energy. It can’t be achieved without hard work and dedication. We aim to instill the confidence and enthusiasm that’s required to learn French in a warm, friendly atmosphere. At LUTECE LANGUE, we aim to support our students and help them to achieve their goals, whether they are learning in Paris or from a distance. When you arrive at Ecole LUTECE LANGUE, you will be welcomed by our professional teachers. All of them are warm, dynamic, and attentive to the students. They are focused on creating the ideal conditions of classroom interaction and they all strive to identify the most effective learning path for each student. The teachers at Ecole LUTECE LANGUE work as a team because our goal is to produce the highest quality French teaching. They achieve coherence between the classes and this ensures the optimal progression of each student. Our teaching method is based on the communicative approach and the emphasis is naturally on oral practice. We teach French in real-life situations, using customized materials which have been carefully chosen by the staff. 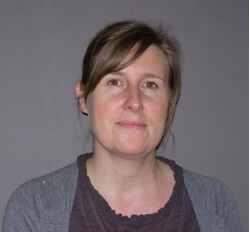 Christine is an expert in French as Foreign Language – FLE with more than 15 years of experience. Her teaching career includes periods in Paris and London. She has taught French to children, students, adults, and professionals. At LUTECE LANGUE, she teaches French from beginner to advanced levels. In addition, as the head teacher of the school, she is in charge of coordination of the teaching staff. She makes sure all the classes run smoothly and that the class levels remain consistent. New students talk to her to test their oral French level. Christine determines the initial class placement and establishes the school course planning every week. Finally, her job also includes giving advice to students by monitoring their progress. 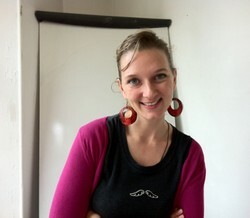 Candy has teaching experience in France as well as abroad (in Morocco, South Korea, India and Equador). Her travels abroad mean she knows how to animate a class with students from different cultures. In addition to general French lessons in the morning, she teaches the afternoon Thematic French Workshops with great passion. The “conversation workshop” will give you the confidence to speak French in daily conversation. She also helps you improve your pronunciation and intonation in the “Pronunciation/Theatrics practice Workshops.” After that, you will advance your expressive and grammar skills in the “Writing Workshops”. Candy also runs the “Paris visit and conversation Workshop”. You will practice speaking French while strolling on the streets of central Paris. It’s a delight to discover the secrets of the city not known to most tourists. Marie is a teacher brimming with energy. She has a playful and progressive teaching approach. She will guide you in your French studies and help you gain confidence. Practice your communication skills while using class activities such as role play. Take part in her oral practice of real-life situations. In her dynamic class, you will learn French with joy and good humor! Dany helps you to understand the French language with his clear and precise explanations. You will improve your communication skills and also learn about general French culture. In his class, you will have guided conversations about current issues in France. You will also deepen your grammatical understanding through dictations and class presentations. This is always followed by a discussion. Improve your comprehension by listening to French songs, etc. Thanks to Dany, if you take his French class, then the language of Molière will no longer be a mystery to you! Even if you are very shy when speaking French, Jean will succeed in drawing out your French!! He is an experienced French teacher with acting experience in the theater. Jean teaches you how to speak French spontaneously. Most of all he uses theatrical techniques and has an excellent knowledge of culture and literature. He will let you play and to learn to love the French language.